la nostra collezione è stata acquistata in aste pubbliche e da commercianti che ritenevamo affidabili. Nel caso degli oggetti che ho volontariamente offerto di restituire, ho ritenuto che le prove fossero sufficienti a dimostrare che la loro fuoriuscita dall’Italia fosse discutibile. She stresses several things. First, that the sources for her antiquities were public auctions or antiquities dealers who were considered "trustworthy". We now know that the dealers included Robin Symes and the auction houses, Sotheby's in London. Second, that this return was a voluntary arrangement. Third, that the evidence was such that it demonstrated that the objects had been removed from Italy in a possibly contentious way. Il Ministero, accettando gli oggetti offerti, riconosce di non avere prove, né richieste legali che sia Leon Levy sia Shelby White abbiano agito illegalmente o impropriamente nella acquisizione di questi oggetti. Certainly there has been no resort to legal action to have these objects returned. Essentially Shelby White's position is this: she is a supporter of archaeology through excavations, publications, research and exhibitions. We need to hope that she will now concentrate on these core activities. However she still owns a collection of antiquities, some on loan to major public collections. Bronze statue of naked youth. Glories of the Past no. 87. "This appears in three Polaroid photos and in about ten photographs in which the small bronze clearly appears still dirty with earth". Said to have been acquired from Robin Symes. Chalcidian neck-amphora. Attributed to the painter of the Cambridge Hydria Cavalcade. Glories of the Past no. 102. "Appears among many seized photographs, where it is shown before proper restoration, with many gaps between the fragments." Attic black-figured neck-amphora of Panathenaic shape. Attributed to the painter of Louvre F 6. Glories of the Past no. 104. Surfaced in Sotheby's (London) July 17, 1985, lot 313. "In the Polaroids, the amphora is broken and dirty with earth. In the other photographs ... it is shown as restored." Attic black-figured neck-amphora. Attributed to a painter of the Medea group. Glories of the Past no. 107. "In four seized Polaroid photographs." An Attic red-figured calyx-krater. A: Zeus and Ganymede. B: Herakles and Iolaos. Attributed to the Eucharides painter. Glories of the Past no. 117. The underside of the foot appears to carry an Etruscan graffito. Known from the Geneva Polaroids ("appears in fragments"). Caeretan hydria. Showing a panther and lioness. "Both these vases were shown in the seized photographs, where they are both broken and in fragments, with sizable gaps." Caeretan hydria. Showing Odysseus and Polyphemos' cave. "Both these vases were shown in the seized photographs, where they are both broken and in fragments, with sizable gaps. An Attic red-figured calyx-krater. Herakles slaying Kyknos. Euphronios. Discussed in Watson and Todeschini, The Medici Conspiracy 128-32. Illustrated in J. Boardman, The History of Greek Vases (London: Thames & Hudson, 2001), fig. 120. According to Watson and Todeschini, "Medici ... Hecht ... Summa Gallery"; then Hunt collection; Sotheby's (New York) June 19, 1990 (US $ 1.76 million); Robin Symes (on behalf of Leon Levy and Shelby White). Polaroids show in "dirty and in separate fragments". Attic black-figured neck-amphora. Attributed to the Bucci painter (by J. Robert Guy). Glories of the Past no. 106. Surfaced in Sotheby's (London) December 9, 1985, lot 132. Attic black-figured psykter. "Departure of a troop of cavalry". Glories of the Past no. 112. "The object in the seized photographs is completely fragmented and pictured on a kitchen tablecloth." I amphore attique à figures noires avec son couvercle, VIème Siècle avant J.C. It also was discussed at length by Chippindale and Gill ("Material consequences of contemporary classical collecting," American Journal of Archaeology 104 : 493-94 [JSTOR]). Why has it been retained? Attic red-figured calyx-krater. Attributed to the Eucharides painter. Formerly Shelby White and Leon Levy Collection. © ANSA. The Italian Ministry is responsible for the Italian archaeological heritage, to preserve it and to guarantee the scientific character of archaeological research and exploration operations. 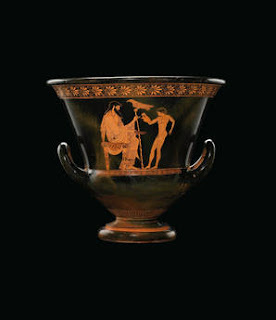 In recognition of the policy of the Italian State to recover archaeological objects and to promote and protect the optimum utilization of Italian cultural heritage, Ms. Shelby White has shown great sensitivity and taken the initiative voluntarily to offer to return ten items, including the Euphronios Krater from her own collection to the Italian State. The objects were consigned to Italy through its Consulate in New York early this year. The Ministry, in accepting the offered items, acknowledges that it has neither evidence, nor legal claim that Leon Levy nor Shelby White acted unlawfully or improperly in acquiring these objects. Both sides express their satisfaction at the successful outcome of the negotiations. Lee Rosenbaum has commented on the above list and wondered if there were differences with the (subsequent) MiBAC list. I have re-posted the Shelby White list with the Italian titles.